The German press is struggling with an internal conflict. From a historical perspective, they are not allowed to glorify anything resembling the far right, but most onlookers agree that although there were indeed Neo-Nazi protesters present in Chemnitz, the largest part of the thousands that marched to show their disagreement with Germany’s current immigration policy were law abiding, mostly older, Germans. Some are now starting to let the other side do the talking too. 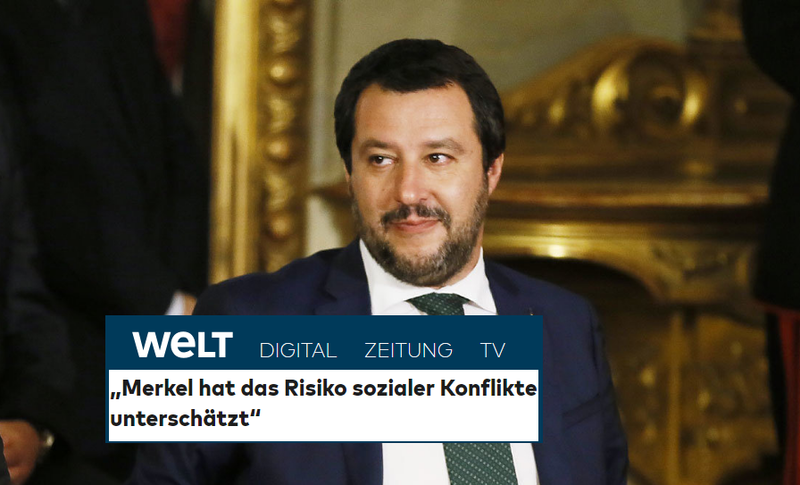 Even though interviews with anyone from Pegida or AfD are still seen as agreeing with their policies, one of the first newspapers to break rank was Die Welt, who asked the Italian rightwing Interior Minister Mr Matteo Salvini to give his views on what was going on in Europe’s biggest economy, which has been rocked by anti-immigration protests for weeks on end. Die Welt: You've seen what's been happening in Chemnitz. Some are blaming Angela Merkel, saying that this is the result of the migration crisis. Do you agree? The AfD has been heading for record highs in the polls and according to the latest estimates, they are reading to overtake the leftwing SPD (who rules in coalition with Ms Merkel’s conservative CDU/CSU as the second party) as Germany’s second biggest political group. This would mean Ms Merkel does not have a mathematical majority to govern anymore. Of course she did. Her mistake was not to take into account the clash that the bringing together to two non-compatible cultures would cause. I would say that not one single person involved in the orchestration of these entire world events underestimated anything. I would say its exactly as they planned and knew it would be. All of them. And If Trump had not been elected it would be that way here now too. WAKE UP PEOPLE THERE IS A PLAN TO RULE THIS WORLD WITH COLLUDING GOVERNMENTS. THE RICH ELITES AND THE DRONES. SICK PERVERTED MURDERS AND PEDOPHILES AND MONEYMONGERS WHO CRAVE POWER AND THINK THEY ARE GOD. THEY WANT TO RAISE YOUR TAXES, TAKE YOUR LAND, AND SQUELCH YOUR SOVEREIGN RIGHTS,AND DESTROY YOUR BEAUTIFUL UNIQUE CULTURES AND HERITAGE. THEY ARGUE INCLUSIVITY, BUT WHAT THEY REALLY WANT IS CHAOS SO THEY CAN TAKE CONTROL. AFTER THAT THERE WONT BE ANY CULTURES BUT ONE… THEIR SICK IDEOLOGIES PUSHED ON AN IMPRISONED SOCIETY WITH NO CHOICE OR FREEDOMS OR IDENTITY. JUST TAKE A WORLDWIDE LOOK AND CONSIDERED WHAT YOUR SEEING.